A unique opportunity aiming to build a portfolio of investments in 100 EIS companies in 12 months or less. Register your interest today to get early access! What are the objectives of the Seedrs EIS100 Fund? Investing involves risks, including loss of capital, illiquidity, lack of dividends and dilution, and should be done only as part of a diversified portfolio. Please read the Risk Warnings before investing. Tax treatment depends on individual circumstances and is subject to change in future. 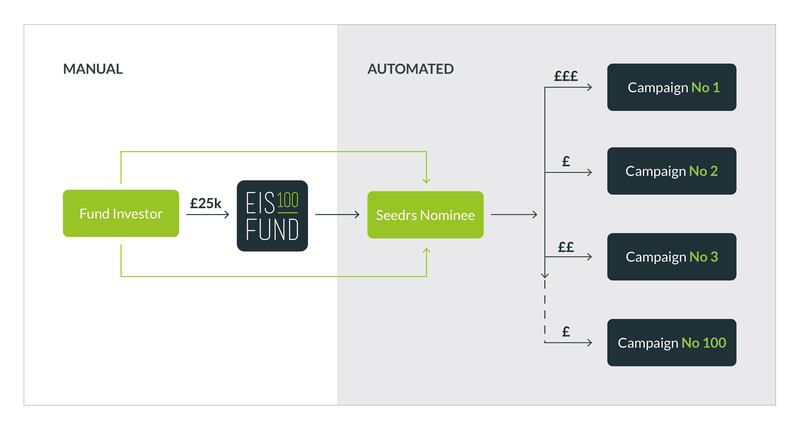 The Seedrs EIS100 Fund (“the Fund”) operates on the basis of deployment logic that enables investors to decide to automatically spread their investments through the Seedrs platform across eligible businesses using a proprietary algorithm. Investment through the Fund will be made at the investor’s discretion on the basis of pre-determined criteria. Seedrs will not exercise any discretion in relation to the selection of investments made through the deployment logic, nor will it perform a fund management role. Each investor will be entitled to any returns from the shares held on their behalf (subject to platform fees). The Fund does not constitute an alternative investment fund, HMRC approved EIS fund, or collective investment undertaking. The Fund is therefore not a “fund” in the traditional sense and use of any terminology relating to investment funds is intended for illustrative purposes only. Deliver an EIS portfolio with low fees. Unique opportunity to build a diversified portfolio of companies deployed in 12 months or less. Potential for investor liquidity through the innovative Seedrs Secondary Market. Investors not limited to liquidity from trade sales or IPO. Potential to generate outsized returns in line with the venture capital asset class. The fund will look to invest into certain eligible campaigns on the Seedrs platform. Once a business has reached certain milestones, the fund will automatically deploy a fixed percentage of the funding round target into the campaign. ¹ Estimate and subject to change depending on number of eligible campaigns and size of funding round. With just one investment decision, the EIS100 Fund grants investors access to up to 100 early stage UK businesses. Most Active UK Funder of Private Companies². First ever equity crowdfunding platform to be approved by regulators anywhere in the world. A strong track record led by an experienced and entrepreneurial management and investment team. 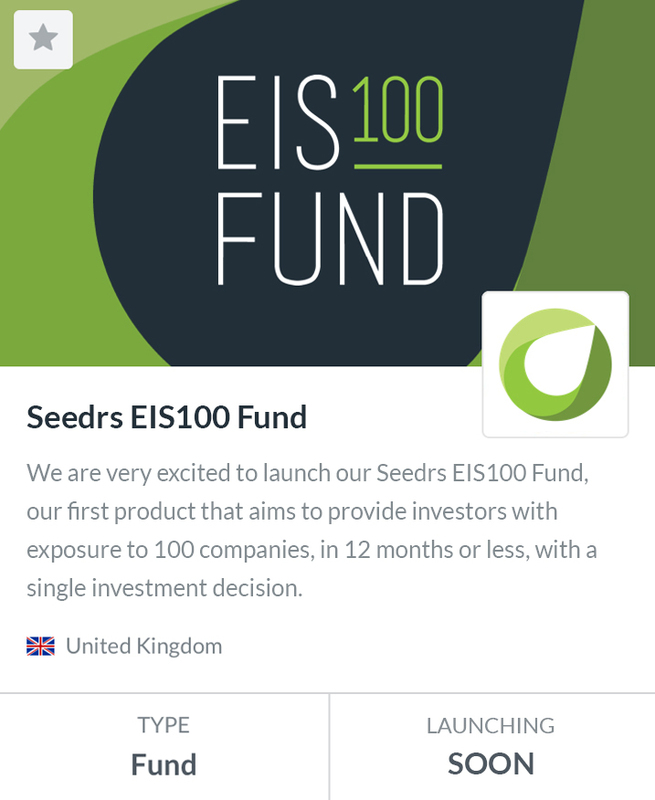 The Seedrs EIS100 Fund is now open for investment. Seedrs does not make investment recommendations to you. No communications from Seedrs through this document or any other medium, should be construed as an investment recommendation. Further, nothing in this document shall be considered an offer to sell, or a solicitation of an offer to buy, any security to any person in any jurisdiction to whom or in which such offer, solicitation or sale is unlawful. Seedrs does not provide legal, financial or tax advice of any kind, and nothing in this document constitutes such advice. 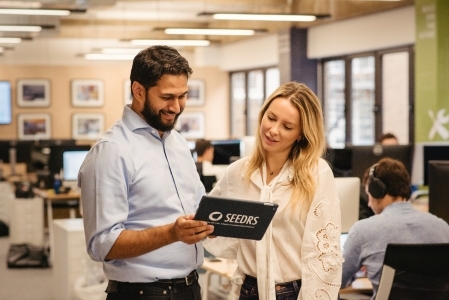 If you have any questions with respect to legal, financial or tax matters relevant to your interactions with Seedrs or its affiliates, you should consult a professional adviser. This document has been approved as a financial promotion by Seedrs Limited ("Seedrs"), which is authorised and regulated by the Financial Conduct Authority (No. 550317). It is not an offer to the public. The summary information provided in this document is intended solely to provide an overview of the fund it describes, and any investment decision with respect to the fund should be made on the basis of the full information package, which will be made available before any investment in the fund is confirmed. Seedrs is a limited company, registered in England and Wales (No. 06848016), with its registered office at Churchill House, 142-146 Old Street, London EC1V 9BW United Kingdom. All investment activities take place within the United Kingdom, and any person resident outside the United Kingdom should ensure that they are not subject to any local regulations before investing.